Between doing market research, scheduling tweets & posts, planning strategy communication paths and applying to jobs I need a good excuse to stay away from the computer yet be productive. I have stopped writing even my thoughts on paper, I do it in my phone. I don’t use Post-its anymore on my fridge, I use my phone. Only when I’m running out of batteries and I’m outdoors then I use my journal. I bought a Planner and I haven’t used it I rely on Google Calendar. I miss the days I worked at a bookstore, I would jump from the Marketing-Business-Entrepreneurial section to the Food Writing and Cookbooks section and on very short breaks I just squeezed myself between Philosophy and Graphic Novels. I’m grateful for the access I had to so many amazing books, yet I decided to pay a weekly visit to my local library and told myself “hmm.. I’ll just go into the same sections and see what I find..” None of the books I was looking for I was able to find, so back home I went and on the computer through the library’s website I finally reserved the books that caught my interest. 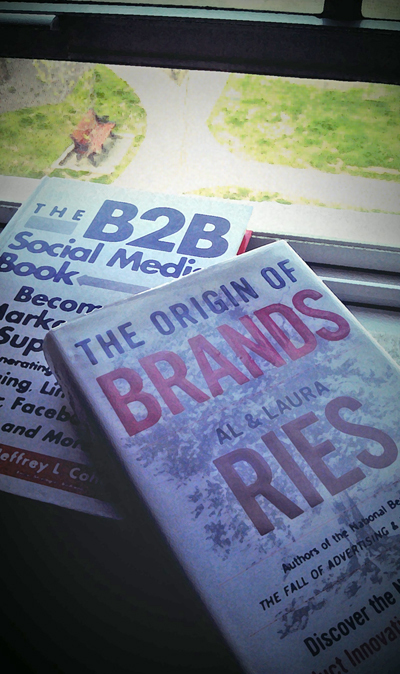 I like how the book about Brands is at least five years old and the B2B SM book is a recent publication. They are complimenting my knowledge and bringing questions I have thought of but with a different perspective. How to calculate true ROI of the marketing programs I’m planning to work on, improving my Content creations, blogging and the use of my social platforms. And the Brands book I’m using it as inspirational and motivation through their real world examples from different companies so I’ll see how it goes once I finish it. Well that’s it I will share my notes next Sunday and hopefully got another interesting book at the library and I’m crossing my fingers this time I don’t encounter the Girl Scout Cookies Stand outside, such temptation, maybe I go in disguise!